Well, my friends, I am less than happy to say that summer is officially here. I’ve never been a fan of hot weather. This year, though, I’m going to try to think of every day of this heat as one day closer to fall. On a happier note, there are two things I like about summer. I do like having more daylight hours. I somehow feel like I have more time to get things done. Best of all, though, is all the fruit available from the local markets. I admit that I get a little giddy when I start seeing the first fresh berries of the season. 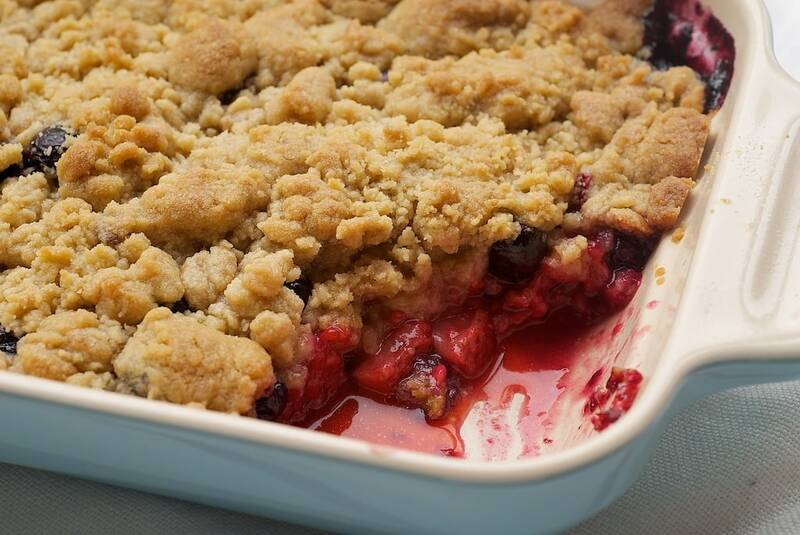 This cobbler celebrates one of the best parts of a summer with a combination of berries. 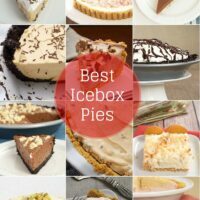 I really like the addition of vanilla to the topping. It supplies just a little extra flavor to complement all that berry goodness. If you’re an ice cream fan, this is just the kind of dessert that begs for a little dollop on top. I used a combination of strawberries, raspberries, and blueberries. Choose a few of your favorite berries, or just stick to one. You never have to make this dessert the same way twice! Mixed Berry Cobbler is a simple and delicious way to enjoy your favorite fresh berries. Preheat oven to 375°F. Grease a 9”x 6” rectangular or 8” round baking dish. Place the berries in prepared pan. Drizzle with the lemon juice. If you use any larger berries, such as strawberries, I recommend chopping them to blueberry-sized pieces. For feeding a crowd, this recipe is easily doubled to be made in a 9”x 13” dish. This looks delicious! I shall definitly try this!! This recipe was amazing!! My family loved it. I did sprinkle some white sugar on the berries and let them sit for a few minutes. I used both fresh and frozen berries. This is the best cobbler I have ever had! Jennifer I making this for my daughter’s class. Can I make it a day ahead? Sure. Refrigerate it after it cools and then reheat before serving. It will serve well at room temperature, if keeping it warm will be an issue. Can this be used with all frozen berries? Don’t want them to get too mushy? Hi, Sarah. I’ve only made this recipe with fresh berries. If I were to use frozen, I would try thawing, rinsing, and drying them to remove excess moisture. I used frozen berries and it worked beautifully! I made this last night with blueberries, blackberries, and a few raspberries sprinkled in. It came out fantastic!! 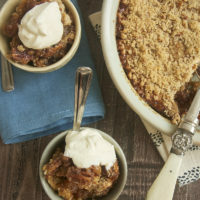 I served it with a scoop of vanilla ice cream and it was the best cobbler I’ve had, hands down! Thanks for the yummy recipe. I understand completely! It’s hard to decide whether I hate the heat more or love the fresh produce more… Quite the dilemma! I wish that I could say that summer has reached us in the UK but it hasn’t. This lovely dessert looks like it would keep you warm even on the most disappointing summer day! 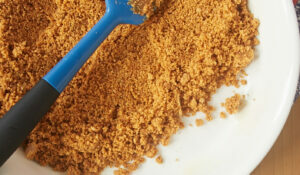 Love your crumble topping, that is one of the most delicious ones I have ever seen. I know I would eat this all myself. We have fresh peaches here in Colorado right now so I am trying this recipe using fresh peaches, and a touch of cinnamon..I’ll let you know how it works out! 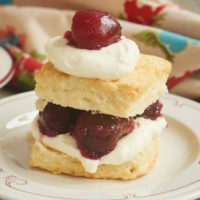 I made this recipe using peaches today! It turned out great! I used 5 fully ripe peeled and cubed peaches. The only change that I made was adding 1/2 tsp cinnamon and 1/4 tsp nutmeg to the dry ingredients. Thanks for such a versatile recipe! Sounds yummy. Has anybody made this the night before serving? Just wondered how that is when it sits overnight. Linda, I’ve made this and eaten the leftovers the next day. The topping might get a bit moist in the underside, but it will still be fine. Thanx Jennifer! I’m trying it tomorrow to take to my daughters. I just popped this in the oven, though the dough wasn’t crumbly. It looked more like cookie dough. Hope it turns out! Will let you know! So yummy!!!! Great recipe!! I’ve made it 3X this summer!! 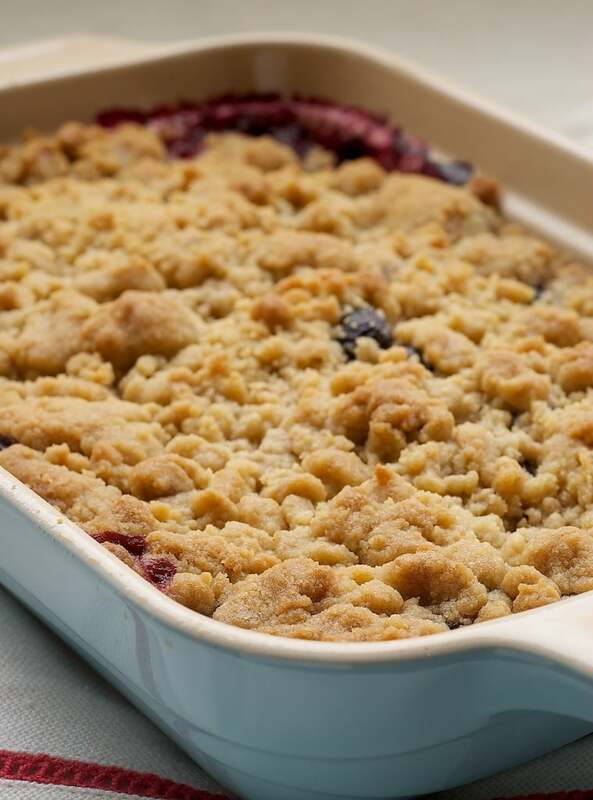 This recipe is great and only requires just a few ingredients compared to other mixed berry cobblers. I used all organic ingredients to make it a bit more healthy. My boyfriend and I loved it! I used organic strawberries, blueberries, and raspberries. The berries were so juicy and tart against the sweet crumbly topping. Yum! I made this for a cookout and it was a huge hit!! Im actually making it again today because of all the requests I got for it. Best cobbler I have ever made! Melissa, that’s so lovely to hear! I’m pretty fond of this cobbler myself. It’s so versatile and always a hit! I just made this tonight and it was DELICIOUS! It was gone by the end of the night, and even one of my friends who doesn’t like cobbler said it was delicious. And it was so easy. Will definitely be making this again! Alex, I’m so glad you liked it! Oh my WOW! I made a double batch last night knowing that we usually like a crisp. My husband gave me a compliment on it before I even asked if he liked it! I used wild black raspberries, frozen peaches and frozen cherries. I also added about 1/4 c chopped pecans to the top for some crunch. This is definitely going to be a favorite recipe. Thanks so much! So glad it was a hit, Jessica! It’s one of my summer favorites! My goodness, was this ever delicious! 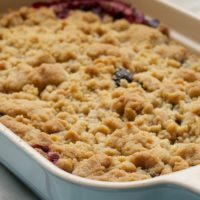 I had some mixed fresh berries starting to get soft in my fridge & decided to make a cobbler differently than I usually make, and I stumbled upon your blog. I looked at your cobbler & noticed that it wasn’t the usual biscuit-topped or “cakey” type of cobbler, so I decided to go for it. Wow, was I impressed! The topping was sweetly balanced & bound together very well, even after baking. My berries plumped up nicely without drying out. I added a dollop of cinnamon whipped cream to my serving, and even had seconds. I will most definitely be making this dessert again, and plan to keep it as my go-to cobbler recipe. Thank you for sharing this recipe, Jennifer! Joyce, I’m so glad you liked it! It’s one of my favorite fruit desserts. That cinnamon whipped cream on top sounds so, so good! This was a hit! Served it with some homemade whipped cream. Good to the last bite! 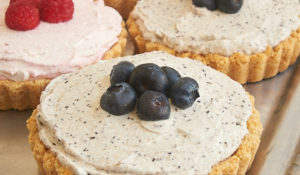 Love the combo of tart berries with the yummy crumbly topping. I’m drooling over this and want to try it out but all the good berries are gone by now! Can you use frozen berries for this recipe? Hi, Gail. Frozen berries should work just fine. Enjoy! Making this for Superbowl Sunday. I am excited! Going to make a double batch and hoping it is a hit. strawberries and mixed berries! Yummmmm. I am already drooling just by your photos. Will let you know how it turns out. I forgot to comment back! This was a success. Everyone loved it and had seconds! I am so thankful for you for sharing such a wonderful recipe. It was delish! I’m so glad you liked it, Mykel! I decided to use fresh strawberries, fresh apples, frozen blueberries, frozen raspberries, and frozen blackberries in here. While the flavor was awesome, the texture was not. There was so much juice left in the pan, it’s equivalent to how far up the pan my topping went. Also, because the topping was so dense, it took much longer to cook than the berries, making the berries squishy, but the apples perfectly cooked. 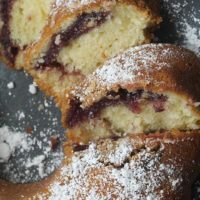 I don’t recommend using frozen berries in this recipe, I recommend looking for one that calls for some cornstarch or flour mixed with the berries to make all the wonderful juice into thick gooey awesomeness! Regardless, flavor was good. Might try it again another time. I have made this twice in the last two weeks! I love that it’s not too sweet. I did use fresh squeezed lime juice one time because I was out of lemons and, for the record, the taste was just as good if not better! Love love love this recipe. Thank you! I’m so glad you like it, Ari! It’s one of my summer favorites! Jennifer! Thanks for this recipe!! I made it with frozen raspberry/blueberry/pomegranate mix I had sitting around in the freezer and it was delicious! Just added a pinch of cinnamon to the crumble and a bit of oats and YUM! I did not find any textural issue with the frozen berries at all. Would recommend!! Thanks for letting me know how it works with frozen berries. Glad you enjoyed it! I doubled this recipe and served it to company – The BEST ever!!!! I also made it early in the day and baked it during dinner – and it was Perfect!! It was so fast and easy – I also served it with vanilla ice cream. This one is a keeper!!! Thank You!! This is my husband &my absolutte favorite dessert! Did not want a cakey one and this topping was to die for….Thank you Jennifer…..Our palates are soooo happy! Margy, that’s so great to hear! On Pinterest I seen it saying to add oatmeal to this recipe to add some crunch but no where here do I see a thing about oatmeal or how much or any reply to it??? Was that an error? Hi, Jan. Whoever pinned it may have added oats when they made it. 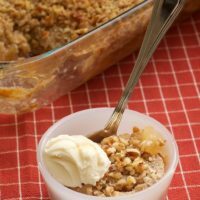 The addition of oats will make it more of a crumble than a cobbler. You might want to use a topping like the one on Cherry Almond Crumble. For those that used frozen berries, did you thaw them first and drain?? Hi, Debbie. You don’t have to thaw and drain them first. The filling may be just a bit thinner. i’ve just made this with raspberries, blackberries and strawberries after searching Pinterest for a recipe to use my leftover berries. Out of 4 of us my dad and I are the only ones that would eat these 3 fruits normally but in this cobbler the whole family have devoured the whole lot and already asked me to make it again! It was seriously yummy! I’m glad it was such a hit, Kari! Hi Jennifer. I just tried your recipe tonight using frozen, unthawed chopped strawberries. The cobbler tasted amazing, but the topping stayed soft and I wanted to know how I could fix that. I would like to make this again and I’m hoping that the topping becomes crisp the next time I make it. Hi, Neeli. The topping should stay pretty soft. If you want a crispy/crunchy topping, then you could use a topping with oats, like the one on these Strawberry Pecan Crumbles. Thank you for responding to my question and for the tip for a crunchy topping. Looks delicious. I’ll be making this for 10 guests tomorrow. If I double the recipe and use a 9 x 13 pan, how long should I bake it? Hi, Penny. The baking time shouldn’t really vary by more than a few minutes if at all. I made this a few times last summer and everyone loved it! I was thinking I might make it for teacher appreciation this coming week. Have you ever made it ahead of time and waited to bake? Would you suggest me sending the dough separate? Thanks for the recipe! Hi, Katie! I think the topping would get soggy if you assemble the entire cobbler ahead of time. I’d either keep them separate until you’re ready to bake it, or bake it in advance and then reheat it for serving. This was absolutely delicious. I used blackberries and blueberries. So very good! I’m glad you liked it, Donna! What a lovely and versatile recipe! Mine is in the oven right now with frozen blueberries, strawberries and raspberries. 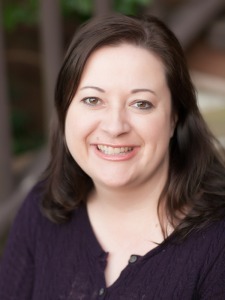 Thank you Jen – Pinned! Hi, just made the cobbler and it tastes great, but do have a good bit of liquid. any idea why that may be? I used strawberries, blueberries and a few raspberries. Did bake it longer than 30 minutes because wasn’t sure it looked dark enough. Hi, Shari. Different berries have different amounts of water content. Strawberries have a good bit, so if your cobbler was heavy on strawberries, that could be the issue. More flour or the addition of a bit of corn starch could help. Thank you, I will try adding a bit more flour. For some reason my dough mixture wasnt enough. Help! Hi, Kristal. Did you use a different sized pan than what’s recommended in the recipe? If not, I’m not sure what could have happened if you didn’t alter the recipe in any way. I just made this but I think I over-softened my butter. My topping was not crumbly at all, it was actually smooth. I’m sure it’ll taste fine, but it looks not so great. I’m actually afraid to try it! lol! I have frozen huckleberries. Should I thaw them out first? Rinse as well? Thinking if I do that, the flavor might be rinsed out. Also should I put a little sugar on the berries? They are not real sweet. Hi, Dollie. I don’t think I’ve ever baked with huckleberries, but I don’t think rinsing berries would take away any flavor. Frozen berries have more moisture, so if you go that route you may need to add a bit more flour or maybe some cornstarch to keep the filling from being too watery. You can certainly sprinkle the berries with sugar if you want them sweeter. Just keep in mind that the topping adds sweetness to the cobbler, too. Thanks. I will thaw out and rinse and try it without surger as well. This is a good recipe , but it is not a cobbler, it is a crisp. I made this for my family and I swear it was gone faster than I would have ever imagined. Served with some vanilla icecream. Everybody LOVED it and so did I. My nephew was saying he was sad he only had one bite left and then the dog ate it. He probably liked it too. I just made this tonight and it was absolutely delicious! Thanks for the great recipe. Can you make it a day or two ahead? Can I use frozen fruit that I froze when they were fresh? You can make it in advance. I would recommend covering it and keeping it refrigerated. Then you can reheat all or part of it when you’re ready to serve. Frozen fruit will have more liquid, so be sure to thaw them well. You may need to add a bit more flour to thicken the mixture. 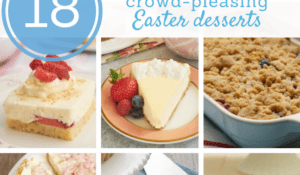 Can you add a premade pie crust to the pan before adding the berries? Hi, Amy. This filling would likely work as a pie, but I’d recommend using a pie pan. The filling has a bit more liquid than you might normally want for a pie, so you may want to add a bit more flour. I made this Cobbler last night to be served at a Pot Luck following this mornings church service. It was a great success success. I was able to warm it slightly before serving. Lots of compliments! I used frozen mixed berries. I did add a tablespoon of minute tapioca to thicken the juices. I do this for rhubarb pie.. The berries didnot turn to mush. This has become a new favourite. Thanks! I’m glad to hear it was a hit, Diane! OMG ! ♥️😋 this is like the most successful recipe i‘ve ever followed 🙏🏻 My family r overwhelmed. The taste, consistency, texture and smell are just just mind blowing. Perfect for summer days 👌🏻 Million Thanx for the recipe. That is so great to hear, Dina! I hope you enjoy it again and again. Made this today. I followed the recipe exactly and it was dynamite! Thank you! My pleasure! I’m happy to hear you liked it, Emily. Will just 3/4 cup brown sugar actually be sweet enough for this cobbler? Looks delish! Just picked some blueberries and blackberries this weekend. Will add a few strawberries and raspberries I had bought at the store and plan on having it with dinner tonight! It’s wonderful. I want to try it right now.